Tents, different sized, ultralight, waterproof tents can hold one person or six people and come equipped with reflective webbing for easy nighttime visibility. Tarps provide both daytime and nighttime shelter from rain and sun. Quick to put up and offers large areas of coverage. Hammocks allow you to rest without coming in contact with wet ground or ground that is swarming with insects. Easily attached to and hung between trees or other solid support. Survival hammocks can hold up to 400 pounds. Insect shelters and netting provide optimal ventilation and maximum protection from mosquitoes, gnats and other flying, crawling and biting insects. Some are similar to one-man tents but are made from see-through mesh netting instead of heavy, dark-colored canvas or nylon. "Mummy" sleeping bags are so-called because the cut of this sleeping bag resembles a mummy's coffin, mummy sleeping bags are designed to insulate you from extreme cold as well as retain body heat better than traditional sleeping bags. Some are also equipped with a hood with a drawstring to maximize heat retention. Mummy sleeping bags are so effective that you can leave the bag in the middle of the night and return to the same level of warmth that existed before exiting the bag. Thermal blankets are lightweight and weatherproof, some thermal blankets have grommets so you can convert them into makeshift shelters if necessary. Manufactured using aluminized polyethylene, thermal blankets effectively reflect body heat back onto the body for maximum warmth. Backpacking stoves can be canister stoves, liquid fuel stoves or hybrid stoves that operate using both canister and liquid fuel. Versatile and useful for boiling water and cooking food, liquid fuel stoves contain a burner, a fuel pump and a fuel canister that produces extremely hot heat. Canister or cartridge stoves have a burner, auto ignition and need a butane fuel cartridge. These stoves are popular with hikers because they are so compact and lightweight. Hybrid stoves will use either a cartridge or liquid fuel but are more expensive than other stoves. Outdoor gear companies also sell stoves that use candles as a heat source. Although not generally hot enough to cook food thoroughly, these stoves are good for heating water and emergency food sealed in pouches. Dehydrated and freeze-dried foods provide days and even weeks of nutrition without the extra weight of canned goods. Dehydrated food only needs water for consumption while most freeze-dried food needs water as well as being cooked. Remote areas usually contain a number of wild animals, some of which may be dangerous. 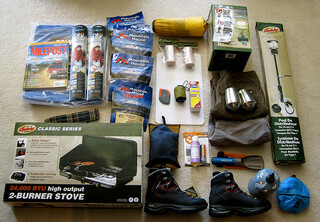 Types of outdoor survival gear frequently needed for self-defense from animals, as well as humans if the emergency involves the aftermath of an apocalyptic event, include pepper spray, mace, pellet guns, crossbows, Tasers and hand claws. You should stock long-term survival retreats with rifles and handguns as well.